The first weekend of May was a neo-Pagan holiday called Beltane. This festivity celebrates the arrival of the spring, the fire, the light after so many months of cold and darkness. It celebrates nature and its cycles as it emphasises the victory of the light over the night, spring and renewal over the cold winter months. 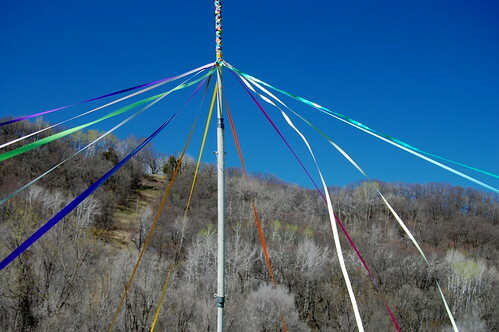 It is generally a fertility celebration, and over time one of the most traditional ways of celebrating it is by dancing a maypole. 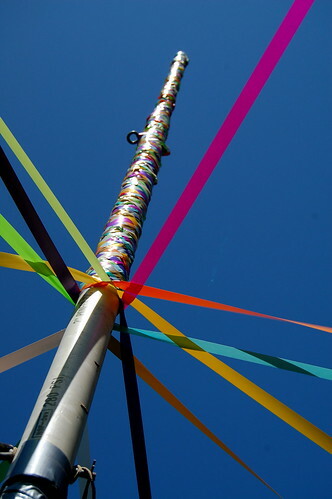 The maypole represents a giant phallus, and often only young women who hoped to conceive would dance. In Celtic traditions, Beltane was also a time when hearth fires were extinguished - a once a year event - and a new fire laid. Much ritual was involved with kindling a community bonfire, and from that celebratory fire, torches were carried home to relight the hearth. Fire was a common ritual symbol as it represented the return of the sun after long winter and the bursting forth of summer energy. It is a time of fun and games, of releasing pent up energy. Games of strength and agility are common. 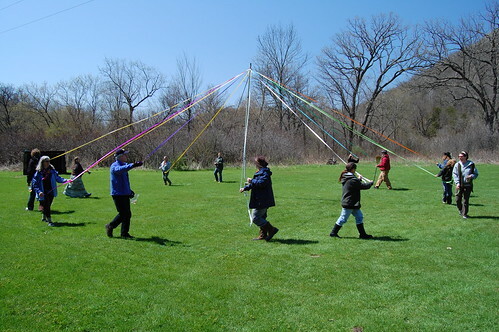 In the context of the (non Pagan) gathering where this particular maypole was danced, there were activities like craft decorating, tossing empty bier kegs, large-scale Ta ka radi (or Jenga) games, and dancing. Musicians played, food was prepared and shared, and laughter dominated the gathering. The rest of the activities generally associated with Beltane are best kept between consenting adults, and result in a surprising number of welcome late-December babies (a date that might ring a bell...). will heed the song that calls them back. and learn the secrets that they hold. crossed with silver and with gold. lie in August's welcome corn. with the blood of all that's born.